I’ve been remiss in updating my blog while feeling myself stuck here in Tucson. Shame on me! I should, instead, be mentioning all the really wonderful aspects of the high desert! Chatting with a neighbor the other day, when he realized the biggest piece of my life had been spent in Hawaii, he asked how I liked Arizona. I actually surprised myself – I didn’t even hesitate to say “I love it”, and I meant it! It wasn’t an easy transition when I moved here from Honolulu – needless to say, the ‘dry heat’ was a shock to my system, and then to discover that winter really does get cold in some places – like the high desert. And to be teased because I actually believed it was cold here – where the population pretty much doubles in the winter with the influx of the snowbirds seeking a warm winter. Warm? 59 degrees? But! I did learn to love it. 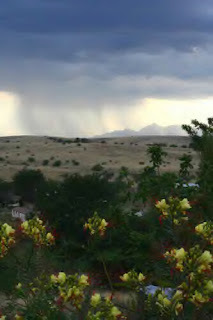 Particularly this time of year – the monsoon season! Tonight has been the perfect example. 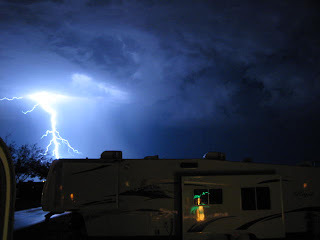 A huge wind kicked up, bringing with it a magnificent light show. And that’s what monsoon means, by the way – big seasonal wind from a different direction! We generally think of it meaning torrential rains, which often come with the directional changes brought by the winds, but not always. 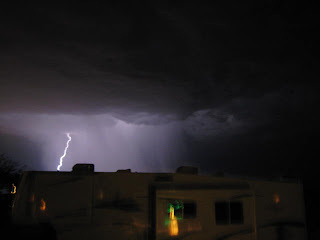 Tonight was a marvelous lightning show, with winds that toppled my lighted palm trees and flag. I even managed to get a few really neat pictures. Then about 20 minutes later, when Misha and I went out for our evening stroll, the skies were clear and the stars were sparkling brilliantly. There was lightning off in the distance still, but here it was clear with just a breath of air to flutter my flag (when I stood it up again!)! The meteorologists are promising rains again tomorrow – which means more winds and lightning and thunder and torrential downpours – so much rain that roads flood and idiots drive into underpasses only to drown their cars. So much rain that the land can’t drink it up and it roars away, taking trees and power lines and cars and boulders with it. This is a wild season – showing off all of Mama Nature’s power – and I love it! 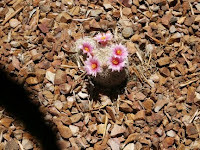 And then there are the flowers – the summer rains bring spurts of growth and flowers. This little guy is only about 2" tall and an inch and a half wide, and look what it puts out! 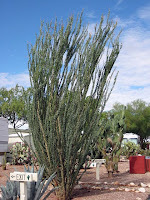 The ocotillo, which appears black and dead much of the year (to most people) burst forth with tiny green leaves after just one good rain. 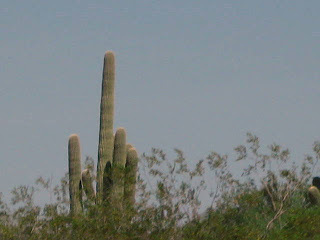 Natives can recognize the saguaro and barrel cactus drink in as much of the live-giving rain as they can, and their skins bulge with the moisture which will sustain them thru the next summer drought. 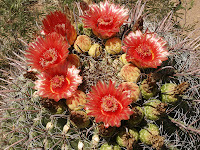 And the cactus flowers – the colors and shapes – they are exquisite in their beauty. 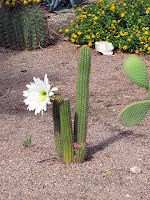 The white flower on the right is about the size of a dinner plate!! And then there are the weeds – the patches of parched earth suddenly are knee deep, and more, with weeds – you can watch the damned things grow!